This blog post was written based on an interview with M.Sc. (Chem.) 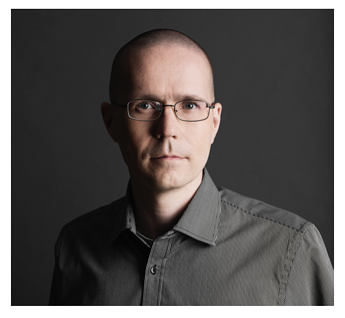 Santtu Jolkkonen, Sparklike's Service and Maintenance Manager, who has been working as technical support specialist for Sparklike over a decade. The topic was centered around the question why should quality control equipment be serviced regularly. 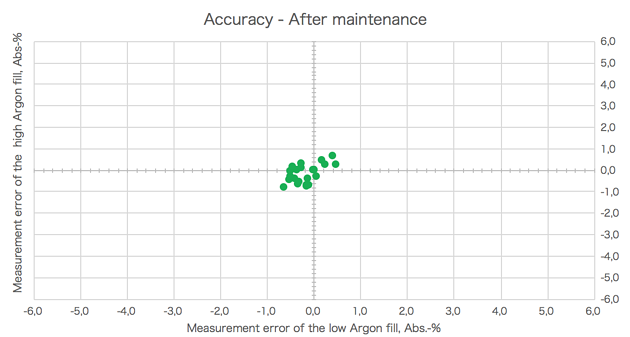 In order to find compelling argumentation to this question, Mr. Jolkkonen used analysis data that clearly showed an important decline in the measurement accuracy for quality control devices that had not gone through annual calibration and maintenance. Furthermore, Mr. Jolkkonen made important reference to the popular concept of The Rule of Ten, according to which improper maintenance of quality control equipment can lead to hidden costs and risks to multiply by 10-fold. "In order to better understand the need for annual calibration for any equipment, let alone for devices that are used daily for quality control, a good starting point is to compare the device's measurement accuracy before and after the device has undergone appropriate calibration and maintenance service." Mr. Jolkkonen says. As can be seen from the graphs number 1 and 2 below, the device's measurement accuracy and precision increase significantly after its maintenance and re-calibration. The results are from 25 Sparklike Handheld™ devices for which Mr. Jolkkonen performed calibration and maintenance service. These devices have been developed to analyze insulating glass gas fill without breaking the insulating glass unit (IGU). "By observing the graphs below, it's clear that the amount of the errors and how much device's maintenance is overdue, are almost directly proportional. However, the direction of the error is not linear. In other words, the error could be +1 % today and -1,5 % next week", Mr. Jolkkonen says. "It's clear that the accuracy and precision of the measurements are key elements when evaluating product quality," he concludes. "Like any other measurement device, also Sparklike devices™ allow reference measurements with the goal of adjusting the measurement results by using calculated coefficient figures. However, it is important to remember that this will lead to reduced measurement accuracy due to the lack of reproducibility and repeatability of the measurement results. That is, if the device does not undergo proper annual maintenance. 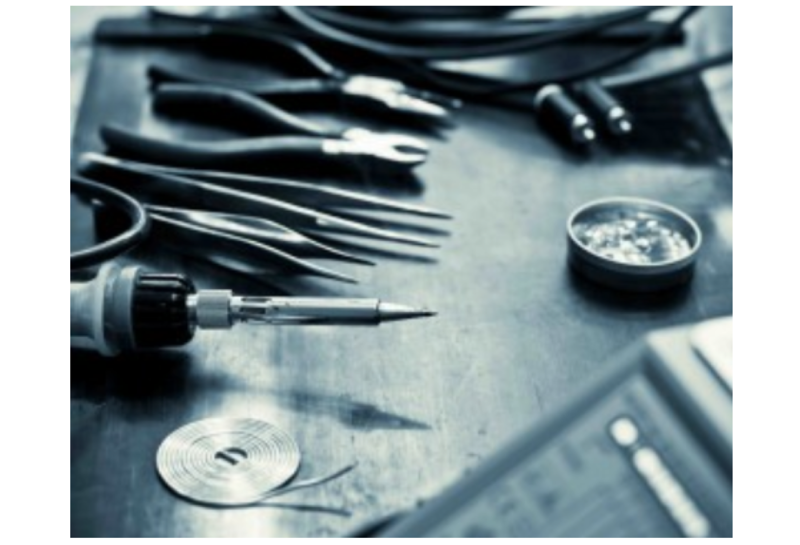 This is partly caused by the fact that instrumental analysis devices contain multiple wear and tear parts that require annual revision. In the case of Sparklike Handheld™ devices, this means the replacement of oxygen filters, optical fiber and electrodes. When left unrevised, this can cause severe deficiencies in measurement accuracy," Mr Jolkkonen continues. 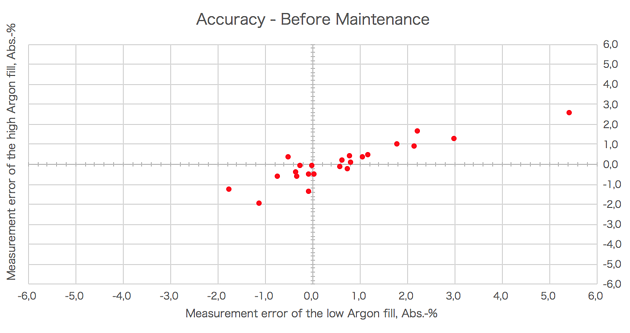 In addition, in order to gain further understanding what neglecting to ensure proper calibration and maintenance to your quality control equipment can cause, it's important to observe what happens to the device measurement accuracy over time. Looking at the graph number 3, it quickly becomes evident how profound effect annual maintenance has on instrumental analysis devices. "When the device has not been services for the last 12 to 18 months, device's measurement accuracy reduces by 50%. 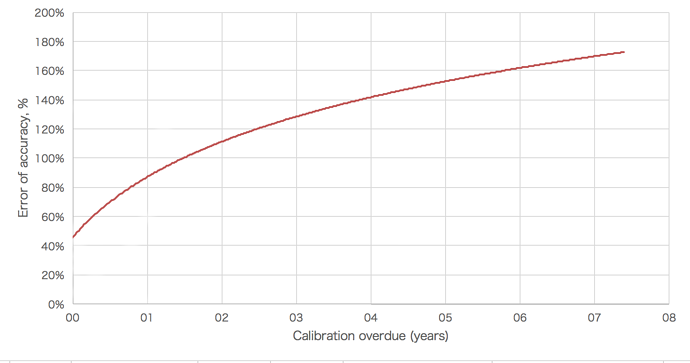 More alarmingly, if the annual calibration is overdue by 24 months, the device measurement accuracy can be reduced by even 100%, " Mr. Jolkkonen summarizes. 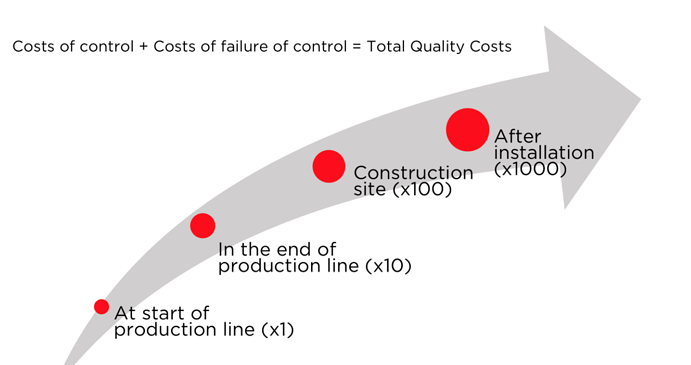 Another equally important reason for annual calibration and maintenance of quality control devices is avoiding the hidden costs and risks associated to imperfect production quality measures. "In the past, insulating glass manufacturers might have hesitated on using their resources to acquire comprehensive quality control equipment. However, it's important to realize that these hidden cost and risks associate to improper production quality processes are much greater than the cost of quality equipment itself, " Mr. Jolkkonen says. 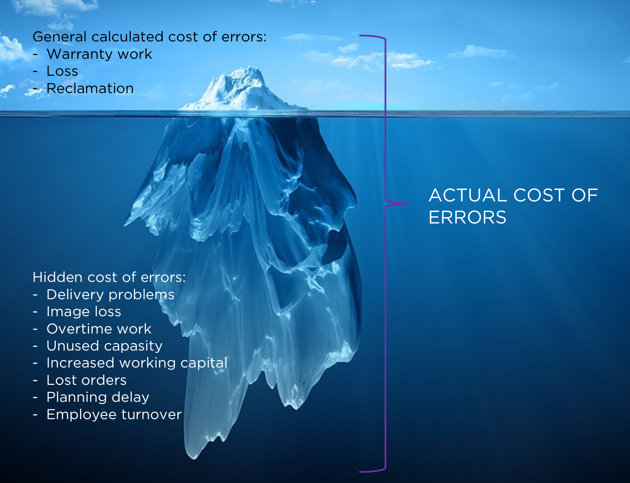 The following figure number 2 clearly demonstrates how much of the actual costs are due to the hidden cost of errors. Furthermore, as can be seen from the figure number 3 below, at every step of the supply chain, the costs and/or risks due to poor quality multiply in 10-fold. Once a low-quality product moves forward in the supply chain, the costs due to production errors multiply 10-folds. This phenomenon is known in the literature as The Rule of Ten. The total quality cost is a sum of the costs of control and the costs of failure of control. In the above figure, the supply chain includes steps starting from the beginning of the production line all the way until the installation of the windows has been done. At this point, the risks and/or costs are already 1000 times greater than in the beginning. "In the end of the day, every company is as good as the quality of their devices and services. Therefore, I find it hard to believe that any company would voluntarily give competitive advantage to their competition due to their improper quality management," Mr. Jolkkonen concludes. 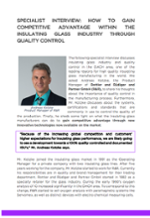 In order to continue reading on how quality control can improve competitive advantage, please click the image below!